Sunderland Lingotot Centre | French and Spanish classes for kids. MFL PPA cover. 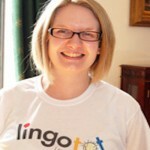 My name is Kate and I run Lingotot for the Sunderland area. Like all new Mams, I was very enthusiastic about taking my little girl, Adelaide, to lots of activities. I always wished I'd learnt a second language at an early age when it's easier to pick up, and so we found Lingotot. I didn't speak any Spanish so we started Lingotot sessions together and we both loved it! I was so impressed, I decided that this really needed to be available in the Sunderland area too, and got involved with Lingotot. I hope you will love learning French and Spanish too. All of the sessions are conducted almost entirely in French or Spanish and you learn with your children. We offer plenty of support for mams, dads and grandparents so you can continue your family's language learning journey at home. Classes are for suitable children aged 6 months +. All babies, toddlers and children are welcome.